Marine plankton. Plankton are a critical food resource for other aquatic organisms that live in freshwater and marine environments. planktos, which means "drifting." In general, plankton have little or no means of locomotion and their distribution is determined largely by water currents and mixing. However, some plankton can swim through less turbulent waters using flagella and other appendages . There are several broad categories of plankton. 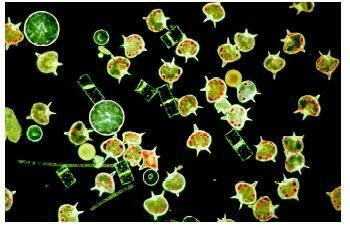 Phytoplankton are small plantlike plankton and are commonly referred to as algae. Phytoplankton are primary producers (they use energy from the sun to make organic food molecules). Bacterioplankton are very small (only seen through a microscope) and include bacteria, fungi, and viruses. Some bacterioplankton play important roles as primary producers and others as decomposers. Zooplankton are planktonic invertebrate animals (for example, the water-flea Daphnia ). Some zooplankton consume phytoplankton, whereas others are predatory and consume smaller zooplankton. Ichthyoplankton are planktonic fish eggs and larvae. The ichthyoplankton are highly vulnerable to predation by invertebrate and vertebrate predators. Plankton are important because they form the base of aquatic food webs . That is, plankton are a critical food resource for other aquatic organisms (such as fish) that live in freshwater and marine environments. Plankton are important to humans because they support recreational and commercial fisheries. Some humans consume plankton directly in the form of dietary supplements. For example, the phytoplankton species Spirulina has been marketed as a source of vitamins and protein . Plankton are also important in processes that control the distribution and movement of energy and essential nutrients such as carbon, nitrogen, and phosphorus. A significant amount of the total global carbon is stored in the ocean. Some researchers have proposed that it is possible to increase the uptake of carbon dioxide generated by human combustion of fossil fuels by increasing production of ocean plankton through fertilization . Researchers debate whether this proposal is practical at a large scale. Hutchinson, G. Evelyn. A Treatise on Limnology, vol. 2. New York: John Wiley & Sons, Inc., 1967. Smith, DeBoyd L. A Guide to Marine Coastal Plankton and Marine Invertebrate Larvae. Dubuque, IA: Kendall/Hunt Publishing Company, 1996.